The Starter Edition (SE) of MTS is equipped with Basic Train Controller module and is bundled with a Demo Start Set library of model rolling stock. In order to register and activate MTS SE in your computer, you must open this page form "Extensions" > "Browse for Extensions" menu in SCARM and then download and install both packages from the links in the bottom. 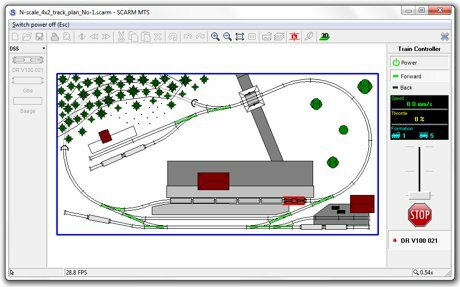 * The number of locomotives and cars in a session and the quality of the simulation depends on the MTS edition, available rolling stock libraries and the capabilities (CPU, RAM, Video) of your PC. If you want more trains and more control options, check the more powerful Model Trains Simulator – Power Edition. More libraries with locomotives and wagons for more complex simulations can be found in the Virtual Rolling Stock database, however, they are intended to be used along with the Power Edition of MTS. Click on each of the links above and open the files either right now in the browser or with double click after saving them on your PC. Restart SCARM after installing of the files in order to use the MTS SE in the program. Read more details about how to obtain, install and start MTS SE in the MTS Online Help. Bemærk The traffic light icons above must show "green" for correct downloading, otherwise the links will not work. If you have troubles when downloading/installing MTS SE components, follow the instructions in the Installation and startup chapter of the MTS Online Help. Danish translation by Thor Marum.